It doesn't get any easier than this. The 2015 Panini NFL Sticker Collection features a large checklist and a simple, hands-on structure that's ideal for beginning collectors. But that doesn't mean that seasoned collectors have to sit out. The set has nearly 500 stickers (476 to be exact). Each of the NFL's 32 teams has a two-page spread and more than a dozen stickers in the album. Besides these regular player stickers, there are several subsets. 2014 award winners, Super Bowl XLIX, past Super Bowl Champions, the NFL Draft, Pop Warner Football and the 2015 Pro Football Hall of Fame class are all part of the 2015 Panini NFL Sticker Collection. Among the 476 stickers are more than 130 foils. 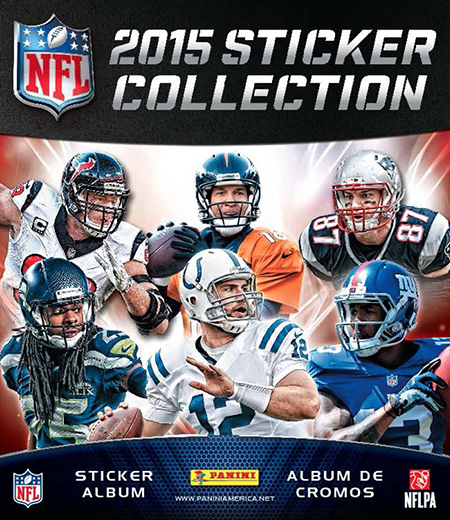 The 2015 Panini NFL Sticker Collection album has 72 full-color pages. Boxes come with 50 packs, each with seven stickers. There are also combo display boxes that have 100 packs and 20 albums. This is a great album – with quality images and bright colors as well as a decent amount of stickers. I really hope the sticker album thing takes off in the US since it really is a big deal in Europe.